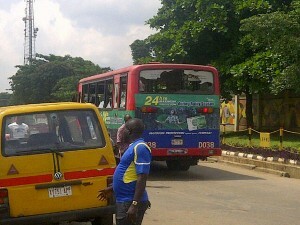 This Bus Rapid Transit (BRT) bus was allegedly vandalized yesterday by commercial motorcycle operators popularly known as ‘Okada’. This incident happened at Berger bus-stop. Reports say policemen later arrived the scene to douse the tension. The motorcycle operators are said to be fomenting trouble to force the government of the state to put a stop to the enforcement of the new traffic law which prohibits motorcycles from plying major Lagos highways. Who blinks first, Fashola or ‘okada’ operators? Let’s wait and see.